Leigh Griffiths scored his first goal at Easter Road as Hibernian improved on a dismal first-half display to earn a share of the spoils with Kilmarnock. The visitors dominated the opening 45 minutes and skipper Manuel Pascali knocked in a loose ball after Graham Stack had stopped a Danny Buijs shot. Half-time substitute Griffiths wasted no time finding the equaliser, firing in off the post from a tight angle. Stack then made two saves to deny James Dayton in a lively second half. Billy Brown's bid to become Hibernian manager on a permanent basis appeared to be on the rocks at the interval after an insipid showing. The home side were chasing shadows for long spells as Kilmarnock knocked the ball around confidently. Former Hibs midfielder Dean Shiels was first to threaten, weaving his way into the left of the penalty area and cutting onto his right foot but Stack held the shot at his near post. The opening goal came as Hibs failed to clear a corner. Stack could only push away a stinging half-volley from Buijs and Pascali tapped in the follow-up. With striker Garry O'Connor isolated up front, Hibs posed no threat in the final third of the park until Brown altered his team at the break. Griffiths came on for Danny Galbraith, with Richie Towell replacing Michael Hart, while Killie replaced striker Paul Heffernan with Gary Harkins. Griffiths, who had been ill during the week, joined O'Connor up front and the on-loan Wolves striker's impact was swift as he equalised five minutes after being introduced following a strong run by Ivan Sproule. Goalkeeper Anssi Jaakkola palmed away Sproule's attempted cross and Griffiths collected on the left before netting off the post from an acute angle. Griffiths then prodded wide after surging into the right side of the box before O'Connor shot tamely from 30 yards. Stack saved a Shiels effort at his near post and Liam Kelly drove wide from long range as Kilmarnock rediscovered some of their earlier passing rhythm. Substitute Dayton's header lacked the pace to trouble Stack before Shiels chipped onto the top of the Hibs net with an audacious effort. Dayton's snap shot on the turn was hit straight at Stack as the match ended level. 90:00+2:55 The final whistle is blown by the referee. 90:00+2:12 Matthew Kennedy is ruled offside. Graham Stack restarts play with the free kick. 90:00+1:29 The ball is swung over by Matthew Kennedy, Graham Stack makes a save. 90:00+0:03 Free kick awarded for an unfair challenge on Liam Kelly by Garry O'Connor. Danny Buijs takes the free kick. 89:42 The ball is sent over by Matthew Kennedy. 87:48 Rory McKeown takes the indirect free kick. 87:48 Substitution Ivan Sproule leaves the field to be replaced by Martin Scott. 87:48 The referee blows for offside. 87:15 James Dayton takes a shot. Graham Stack makes a save. 85:20 David Stephens challenges Gary Harkins unfairly and gives away a free kick. Dean Shiels takes the free kick. 84:09 Mohamadou Sissoko challenges Ivan Sproule unfairly and gives away a free kick. The ball is crossed by Garry O'Connor, Leigh Griffiths takes a shot. Anssi Jaakkola makes a save. 82:46 A cross is delivered by Richie Towell, clearance by Manuel Pascali. 81:56 Dean Shiels produces a right-footed shot from just outside the area that goes harmlessly over the target. 80:04 Indirect free kick taken by Manuel Pascali. 80:04 Booking Isaiah Osbourne receives a yellow card for unsporting behaviour. 79:46 Unfair challenge on Liam Kelly by Isaiah Osbourne results in a free kick. 79:02 The ball is crossed by Dean Shiels, Gary Harkins takes a shot. Save by Graham Stack. 79:02 Booking Booking for David Wotherspoon. 78:42 David Wotherspoon gives away a free kick for an unfair challenge on Matthew Kennedy. 77:40 Substitution Garry Hay goes off and Matthew Kennedy comes on. 77:27 Shot from long range by Liam Kelly misses to the left of the net. 76:09 David Stephens gives away a free kick for an unfair challenge on Mohamadou Sissoko. Anssi Jaakkola takes the indirect free kick. 75:29 Free kick crossed by Paul Hanlon. 75:29 Booking James Fowler goes into the referee's book. 75:17 James Fowler challenges Leigh Griffiths unfairly and gives away a free kick. 73:41 Dean Shiels takes a shot. Graham Stack makes a save. 73:18 The ball is swung over by James Fowler, blocked by David Stephens. 72:44 Centre by Danny Buijs, James Dayton takes a shot. Graham Stack makes a save. 71:28 Garry O'Connor concedes a free kick for a foul on Manuel Pascali. Manuel Pascali restarts play with the free kick. 70:20 Garry O'Connor takes a shot. Save by Anssi Jaakkola. 69:20 The referee blows for offside against David Wotherspoon. Rory McKeown takes the indirect free kick. 68:19 James Dayton produces a cross, David Stephens makes a clearance. 67:33 Paul Hanlon is flagged offside by the assistant referee. Direct free kick taken by Anssi Jaakkola. 66:32 James Fowler concedes a free kick for a foul on Paul Hanlon. Free kick taken by Paul Hanlon. 66:02 Gary Harkins produces a cross, save by Graham Stack. 65:04 A cross is delivered by David Stephens, Paul Hanlon takes a shot. Save by Anssi Jaakkola. 64:25 Unfair challenge on Garry O'Connor by Mohamadou Sissoko results in a free kick. The free kick is delivered right-footed by David Wotherspoon from left channel, Manuel Pascali makes a clearance. 63:51 Leigh Griffiths fouled by James Fowler, the ref awards a free kick. Paul Hanlon takes the free kick. 62:19 Substitution James Dayton comes on in place of Danny Racchi. 62:19 Garry O'Connor is ruled offside. Indirect free kick taken by Manuel Pascali. 60:04 Shot from outside the box by Danny Racchi goes wide right of the target. 57:38 Foul by David Stephens on Danny Racchi, free kick awarded. Rory McKeown restarts play with the free kick. 56:08 Free kick awarded for an unfair challenge on Dean Shiels by Isaiah Osbourne. The free kick is swung in left-footed by Garry Hay. 55:44 Dean Shiels takes a shot. Blocked by David Stephens. 54:48 Free kick awarded for a foul by Isaiah Osbourne on Dean Shiels. Direct free kick taken by Dean Shiels. 52:02 Close range effort by Leigh Griffiths misses to the right of the goal. 50:31 Outswinging corner taken by Dean Shiels from the right by-line, Effort on goal by Mohamadou Sissoko from inside the area goes harmlessly over the bar. 48:56 Assist by Ivan Sproule. 48:56 GOAL - Leigh Griffiths:Hibernian 1 - 1 Kilmarnock Leigh Griffiths finds the net with a goal from close range to the bottom right corner of the goal. 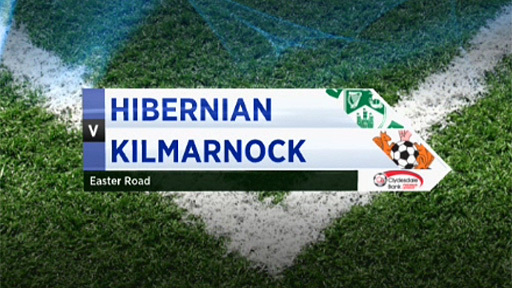 Hibernian 1-1 Kilmarnock. 46:35 Gary Harkins handles the ball and concedes a free kick. Graham Stack takes the free kick. 45:01 The second half kicks off. 45:01 Substitution Gary Harkins replaces Paul Heffernan. 45:01 Substitution Leigh Griffiths joins the action as a substitute, replacing Daniel Galbraith. 45:01 Substitution (Hibernian) makes a substitution, with Richie Towell coming on for Michael Hart. 45:00+0:12 It is the end of the first-half. 43:54 Isaiah Osbourne concedes a free kick for a foul on Garry Hay. Dean Shiels restarts play with the free kick. 41:18 Unfair challenge on Daniel Galbraith by Mohamadou Sissoko results in a free kick. David Wotherspoon shoots direct from the free kick. 40:11 Dean Shiels concedes a free kick for a foul on Daniel Galbraith. Paul Hanlon takes the free kick. 39:04 Free kick awarded for an unfair challenge on Dean Shiels by David Wotherspoon. Free kick taken by Danny Buijs. 38:48 The ball is sent over by Ivan Sproule, Paul Hanlon takes a shot. Save by Anssi Jaakkola. 36:05 Danny Buijs provided the assist for the goal. 36:05 GOAL - Manuel Pascali:Hibernian 0 - 1 Kilmarnock Manuel Pascali scores a goal from inside the six-yard box to the top left corner of the goal. Hibernian 0-1 Kilmarnock. 35:50 Danny Buijs takes a shot. Save made by Graham Stack. 35:02 Corner taken right-footed by Dean Shiels, clearance by Isaiah Osbourne. 34:27 Foul by Lewis Stevenson on Dean Shiels, free kick awarded. Danny Buijs restarts play with the free kick. 31:54 The ball is swung over by Ivan Sproule, clearance made by Mohamadou Sissoko. 31:15 Dean Shiels takes a shot. Save made by Graham Stack. 30:22 Sean O'Hanlon concedes a free kick for a foul on Paul Heffernan. Liam Kelly restarts play with the free kick. 29:54 Ivan Sproule challenges Danny Racchi unfairly and gives away a free kick. Danny Buijs takes the direct free kick. 29:19 Danny Racchi gives away a free kick for an unfair challenge on Daniel Galbraith. Free kick crossed right-footed by David Wotherspoon from left channel, clearance by Manuel Pascali. 27:02 The ball is delivered by Rory McKeown. 26:42 Dean Shiels takes a shot. Sean O'Hanlon gets a block in. 23:53 Foul by Garry Hay on David Wotherspoon, free kick awarded. The free kick is swung in right-footed by David Wotherspoon, save by Anssi Jaakkola. 22:05 The referee gives a free kick against Ivan Sproule for handball. Manuel Pascali takes the free kick. 21:37 Garry Hay takes a long range shot harmlessly clearing the crossbar. 20:46 Inswinging corner taken right-footed by David Wotherspoon from the left by-line, save by Anssi Jaakkola. 20:19 Isaiah Osbourne sends in a cross, blocked by James Fowler. 19:24 Michael Hart crosses the ball, James Fowler makes a clearance. 16:33 The ball is swung over by Dean Shiels. 14:38 The ball is delivered by Danny Buijs, Graham Stack makes a save. 12:48 A cross is delivered by James Fowler, clearance by Michael Hart. 11:09 Lewis Stevenson gives away a free kick for an unfair challenge on Danny Racchi. Free kick taken by James Fowler. 10:06 Free kick awarded for a foul by Liam Kelly on Isaiah Osbourne. Free kick taken by Paul Hanlon. 3:34 Foul by Michael Hart on Garry Hay, free kick awarded. Dean Shiels takes the direct free kick. 3:05 Booking David Stephens booked. 2:06 The referee penalises David Stephens for handball. Dean Shiels restarts play with the free kick. Effort on goal by Rory McKeown from a long way out goes over the bar. 1:51 Manuel Pascali takes a shot. Save by Graham Stack. 1:17 Corner taken by Dean Shiels from the right by-line, Lewis Stevenson makes a clearance.